Escape the urban bustle at Nature & Wildlife Tours and Berry Springs Nature Park. You'll get in some beach time at Mindil Beach and Lameroo Beach. Step out of Darwin to go to Berry Springs and see Territory Wildlife Park, which is approximately 42 minutes away. Spend the 27th (Mon) on the water with a fishing tour. Plan for a day of cool, family-friendly fun on the 31st (Fri) at Darwin Waterfront. And it doesn't end there: identify plant and animal life at Crocosaurus Cove, get a new perspective on things with Boat Tours & Water Sports, make a splash at Wave Lagoon, and examine the collection at Museum & Art Gallery of the Northern Territory. Dusseldorf, Germany to Darwin is an approximately 27-hour combination of train and flight. You can also fly; or do a combination of bus and flight. You'll lose 8 hours traveling from Dusseldorf to Darwin due to the time zone difference. Prepare for much warmer weather when traveling from Dusseldorf in May: high temperatures in Darwin hover around 38°C and lows are around 26°C. Finish your sightseeing early on the 3rd (Mon) so you can travel to Batchelor. On the 4th (Tue), look for all kinds of wild species at Litchfield National Park. 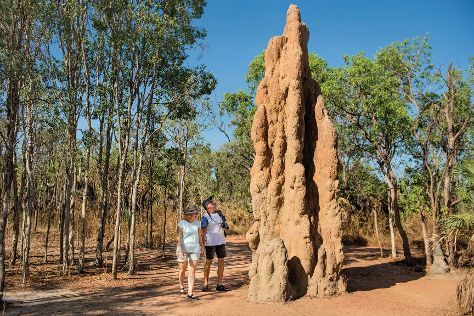 Here are some ideas for day two: explore the striking landscape of Buley Rockhole, then admire the sheer force of Florence Falls, and then explore the striking landscape at Magnetic Termite Mounds. To find maps, traveler tips, where to stay, and more tourist information, go to the Batchelor trip planner. Traveling by car from Darwin to Batchelor takes 1.5 hours. In June, daily temperatures in Batchelor can reach 36°C, while at night they dip to 23°C. Wrap up your sightseeing on the 5th (Wed) early enough to travel back home.